Freelance journalist Richards chronicles how five single women attempted to take charge of their own fertility. The author challenges the “cultural stereotype of…Clock Tickers”—women who have reached their mid-30s without becoming mothers. Some of these women are now buying time by freezing their eggs. They have failed to find the right partner, frequently postponing marriage to pursue a higher education and a career. While menopause is not yet an issue, the viability of their eggs, with respect to quality and quantity, is increasingly problematic. Egg-freezing technology was initially developed in the 1980s for cancer patients facing radiation treatment, and it is now coming into use for storing donor eggs as a means of obviating moral consideration about freezing embryos. Although over the years the technology has improved and the potential success rate is now higher (although it is still only 30 percent), the results are best for eggs harvested from women under age 35. 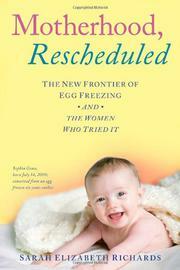 In alternating chapters, Richards takes up the thread of her own story and that of four other women in similar situations: their decision to freeze their eggs as a precaution; the search for a potential husband who shares their desire for children; dealing with the physical and financial cost of the procedure; and successes and failures of pregnancy after implantation. She writes movingly about the vicissitudes of online dating and the pain of the breakup of a loving relationship with an ambivalent partner, as well as the anguish many women feel when contemplating a childless future. For a childless woman, Richards writes, egg freezing is “an act of love for her future family,” even though older motherhood is not the most desirable option. A page-turner in which each of the stories is different but compelling.